← Let’s See That Again! If Pisa’s tower didn’t lean, why would anyone go there? That’s not to say that the city of Pisa is unappealing, but there are lots of other towns throughout Italy that are equally charming, and they are not on the must-see list for most tourists. 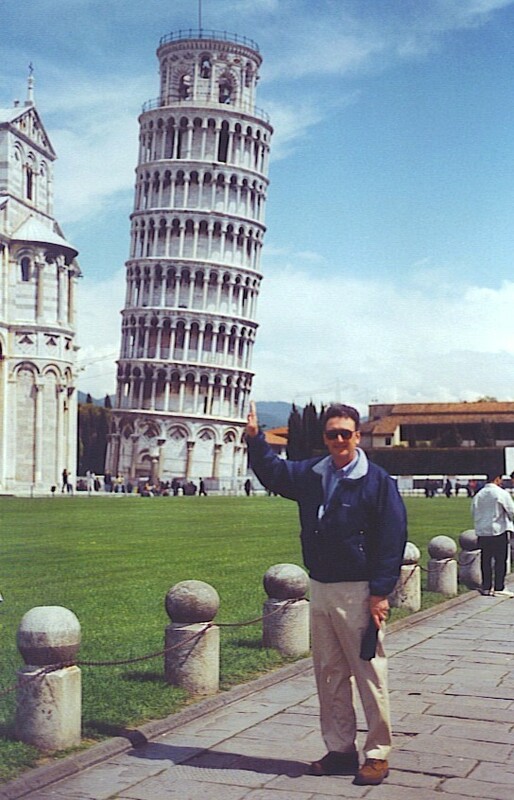 Pisa draws crowds to stare at a monumental mistake. It’s about a half-hour walk from the central train station to the Piazza di Miracoli, the square that includes Pisa’s cathedral and its famously flawed bell tower. The cathedral and baptistery were already in place when work began on the tower in 1174. The builders no doubt had the best of intentions, but nobody seems to have done any engineering studies of the soil at a site not far from the mouth of the Arno River. Apparently they ignored the fact that the name Pisa is derived from a Greek word that means “marshy land”. By 1178, after construction of the third floor, it was evident to even casual observers that the tower had begun to sink. The city’s leaders had more pressing problems, though — they were involved in wars with neighboring city-states such as Genoa, Lucca, and Florence, so construction on the tower had to be abandoned for almost a century. That may have been a stroke of luck, because that period of neglect gave time for the subsoil to settle somewhat, stabilizing the precarious foundation. When construction finally resumed in 1272, some genius came up with a plan to disguise the tilt: The upper floors were built with one side taller than the other, to make it look straight. You may not have a degree in engineering, but you can probably guess what effect that additional weight had. The torre pendente, as it is known to the Italians, was completed toward the end of the 14th century. It was designed to be 185 feet tall, and sure enough, some part of it is exactly that tall. The height is currently 183 feet on the low side and 186 feet on the high side. That means it is something like 12 feet from perpendicular; about four degrees from straight up and down. By the way, that story about Galileo dropping cannon balls off the leaning tower to prove something or other about gravity is probably not true. A guy who understood the effects of gravity wouldn’t set foot in that thing. There have been predictions of the tower’s imminent collapse for centuries, and several attempts have been made to keep it from toppling, including one as recently as 2008. Pisa’s city fathers have put stipulations on repair jobs, though; they assume that tourists probably wouldn’t swarm to see the Perfectly Straight Tower of Pisa. Officials want the tower to continue to lean, so periodically counterweights have been added, or soil has been removed, or cables have been connected. Recently the angle of incline was straightened slightly, so that the tower is about how it was a couple of hundred years ago. That will undoubtedly change, since the nearby cathedral and baptistery are gradually sinking. There are a couple of other bell towers on other churches in Pisa that are now leaning, too, although not as spectacularly. Keeping the tower from collapsing seems to be a job that will never be finished… not unlike the plumbing in my home. This entry was posted in History, Travel and tagged Leaning Tower of Pisa. Bookmark the permalink.